It was his first job as a mines mechanic and says he has seen the good times and the bad in his working life, which has included two stints as a TAFE teacher broken in the middle by a return to the coalface to further his skill set. 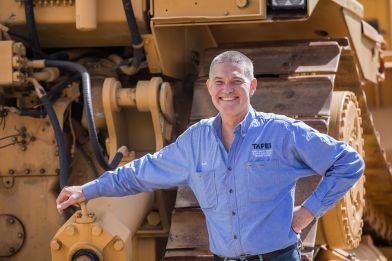 “I left TAFE for three years to pursue advancement within my field of training in the mining sector in maintenance training management but an industry downturn proved fatal for that decision,” he said. Mr O’Connell comes from a strong labour background, and has been “a proud union member” since he was 16 — “as a first-year apprentice in the coal industry that couldn’t wait to join up”. He needed little encouragement to put his hand up for the Federation Representative and TAFE TA Councillor roles. “It was my own inner drive and motivation, that little voice in the back of my head that said, ‘Hey mate, we need to ensure that every employee gets treated fairly, has good working conditions and gets paid accordingly for the work they produce’,” said Mr O’Connell, whose teaching areas include mobile plant equipment, heavy vehicles and auto electrical. He believes the nation is facing tertiary educational problems now because the Government wanted TAFE to be run like a business and not a commonwealth educational institution. “It is a fact that the economy grows and falls, never getting to an even balance, so there are lean times and good,” he said. “The fluctuating market and jobs growth is out of TAFE’s control, but what is in TAFE and the governments’ control is to ensure the good times are fully supported by an educational infrastructure that produces the best tradespeople we can. “Nothing comes without a cost, so to continue to cut budgets, reduce face-to-face teaching hours and to close campuses is not the answer. What he loves about TAFE teaching is the argument he would use for anyone undecided about representing their workplace. “Would you like a flexible rewarding workplace that offers fair wages, deserved realistic time off in line with the hard work that you do as a teacher?” he would ask. To have conditions that a lot of employees only dream of, see government guaranteeing high-level funding towards public education? He recently shed his rock star locks for a good cause, the World’s Greatest Shave, raising money for the fight against blood cancer.